✪ Keyboard Pro helps you create unique texts in seconds! emotes for texting, email, and Facebook! ✓ Mess with your friends by sending Decorated Text and Upside-down Text! Take your iPhone and iPad keyboard to new heights of expression with this awesome addition to your keyboard. 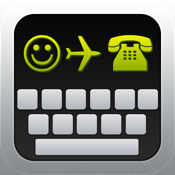 Keyboard Pro enables you to easily create works of text art featuring Japanese and Western style emoticons across a range of themes.